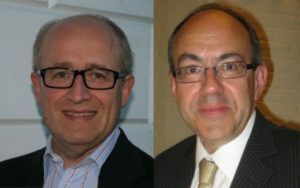 Professor Jonathan Firedland, Head of Infectious Diseases and Immunity, and Professor Francis Drobniewski, Professor of Global Health and Tuberculosis, were elected Fellows of the European Society of Clinical Microbiology and Infectious Diseases (ESCMID) in early May. The title ‘ESCMID Fellow’ recognises individuals who have achieved professional excellence and outstanding contribution to the field of microbiology and infectious diseases. Professor Friedland’s research interests lie in innate immune response and novel host directed therapies for tuberculosis and migrant health. Professor Drobniewski’s research group focuses on all aspects of tuberculosis and its interaction with HIV. Since its founding in 1983, ESCMID has evolved to become Europe’s leading society in clinical microbiology and infectious diseases with members from all European countries and all continents. Professors Friedland and Drobniewski are amongst the first 120 Fellows to be selected from a membership of around 7,500. A complete list of Fellows is available on the ESCMID website. Nicola Lynskey was awarded a highly prestigious Sir Henry Wellcome Postdoctoral Fellowship. The sum awarded was £250,000 over 4 years, and is likely to commence April 2014. Paper published in PLoS Pathogens: RocA Truncation Underpins Hyper-Encapsulation, Carriage Longevity and Transmissibility of Serotype M18 Group A Streptococci. Abstract: Group A streptococcal isolates of serotype M18 are historically associated with epidemic waves of pharyngitis and the nonsuppurative immune sequela rheumatic fever. The serotype is defined by a unique, highly encapsulated phenotype, yet the molecular basis for this unusual colony morphology is unknown. Here we identify a truncation in the regulatory protein RocA, unique to and conserved within our serotype M18 GAS collection, and demonstrate that it underlies the characteristic M18 capsule phenotype. Reciprocal allelic exchange mutagenesis of rocA between M18 GAS and M89 GAS demonstrated that truncation of RocA was both necessary and sufficient for hyper-encapsulation via up-regulation of both precursors required for hyaluronic acid synthesis. Although RocA was shown to positively enhance covR transcription, quantitative proteomics revealed RocA to be a metabolic regulator with activity beyond the CovR/S regulon. M18 GAS demonstrated a uniquely protuberant chain formation following culture on agar that was dependent on excess capsule and the RocA mutation. Correction of the M18 rocA mutation reduced GAS survival in human blood, and in vivo naso-pharyngeal carriage longevity in a murine model, with an associated drop in bacterial airborne transmission during infection. In summary, a naturally occurring truncation in a regulator explains the encapsulation phenotype, carriage longevity and transmissibility of M18 GAS, highlighting the close interrelation of metabolism, capsule and virulence.